This Mid Century sculpture has three globes green, blue and a combination of both colors. Our glass sculptures needs light to realize its brilliance. Where better to find that light but in your garden or home. We feel that our glass needs you as much as your garden or home needs our glass. Let the colors shine in your flowers, along your paths and in among your hardscape and seating or within your home. In order to achieve our goal we designed and had custom made wrought iron stands for proper presentation and to hold your glass securely. Lime green glass is the primary color, I left the jagged edge of the glass on the right side to give the piece drama. I placed three circles to represent the planets, they are spaced evenly to give texture. The first circle is dark blue, the second circle is slightly larger with white, dark blue and yellow waves. The third circle is the smallest circle in the lime green glass with a small pale green rod on the top to show separation. This piece is to show my version of planetary alignment with magnetic force. On the lower left is a strip of pale yellow glass and a pale green rod to add balance. The green I chose for this piece was a very prominent color in the late 50's and early 60's. The use of the dark blue gives a very Mid Century Modern vibe to my work. The use of one, and two colors on different levels makes for additional secondary colors. All of our pieces are dramatically effected by the light and give different variations as you adjust their position. 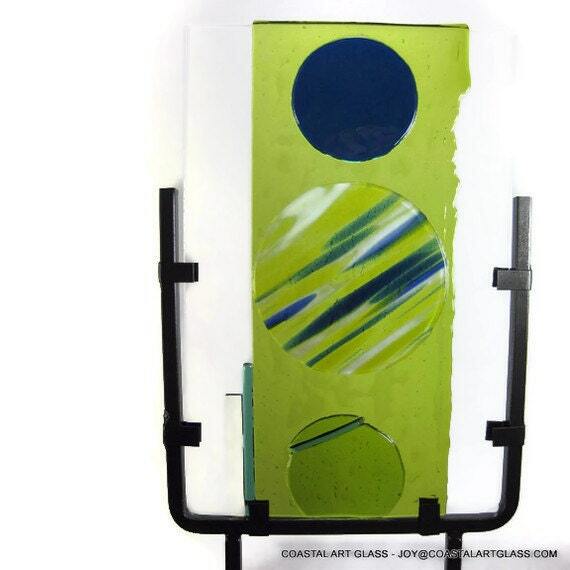 This Studio Art measures 7 7/8" W x 12" H for the glass itself. A wrought iron table top stand comes with this stand comes with this piece. A largere one is available at additional charge, please email me for prices. Each Art Glass piece is one of a kind. Many require multiple firings to achieve the end result. The descriptions are what I see and feel as the artist. No photographs can completely capture the brilliance of the glass. All our glass is lead free. Hand washing recommended. Bring in during the winter as water caught in the details might freeze and damage the glass.